I upped a new entry into my top 10 worst films of all time, the absolutely stank rendition of Howl, starring J. Franc. I’m not even a Franco-hater, his wanting seems nice, and I was rooting for him, and it’s not really his performance that blows the dog (though it’s certainly often cringey: don’t know why they didn’t get David Cross after his performance in I’m Not There). Mostly, whoever wrote this script is a dingdong. I mean, they literally present animations that act out trippy renditions of a full reading of the poem, complete with bros on the rooftops of the city shooting up and howling. The rest is just an interview with Ginsberg in Franco style, and a milky version of the obscenity trial for the book. 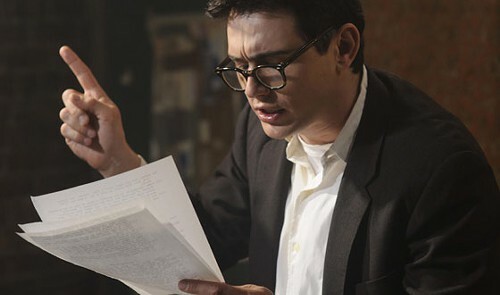 The guy who plays Kerouac looks like a game show host. Jeff Daniels hangs out. I can’t think of many good movies about writers: it’s not exactly food for wow. Naked Lunch was good. I like Wonder Boys for some reason, and Barton Fink. I didn’t like Barfly though I’m sure there are some hounds here. I’m sure I’m blanking on some others. What you got?